I have this friend and whenever we catch up it’s always over a meal and then we always get dessert after. We actually met while on a Topdeck tour in Europe and initially bonded over searching for cake in Switzerland and the bond was sealed over gelato, pizza and pasta in Italy so it was only natural that food would remain a part of our friendship back home in Sydney. Over the past four years of friendship, we have slowly been eating our way through Newtown, which became our meet up point. And our last catch up was no exception; we caught up to try out Italian Bowl in Newtown. My friend had tried it before, and we had passed it a dozen times on our previous visits but on our last visit to Newtown we noticed the restaurant had expanded in size and despite our full stomachs at the time, the aromas coming out were so delicious and enticing that we immediately decided our next catch up would be there. We met up for Saturday lunch and it wasn’t too busy when we arrived around 1pm. The restaurant is choose your own adventure style in that you pick the type of pasta and the sauce you would like to go with it. I was pleasantly surprised to see gnocchi was an option as it’s not that common, but a lady outside was eating the tortellini and it looked so good that I ended up getting the beef tortellini with the arrabiata sauce ($12) and my friend good the same sauce but with the fettuccini (also $12). A little bit nervous because although a good Arrabiata sauce is delicious, I find it’s hardly ever done well. It wasn’t much of a wait before our bowls of pasta were served to us. I sprinkled some parmesan on top and took my first bite and was immediately glad I took the risk ordering the arrabiata because it was done really well. Really well seasoned with the right amount of chilli. 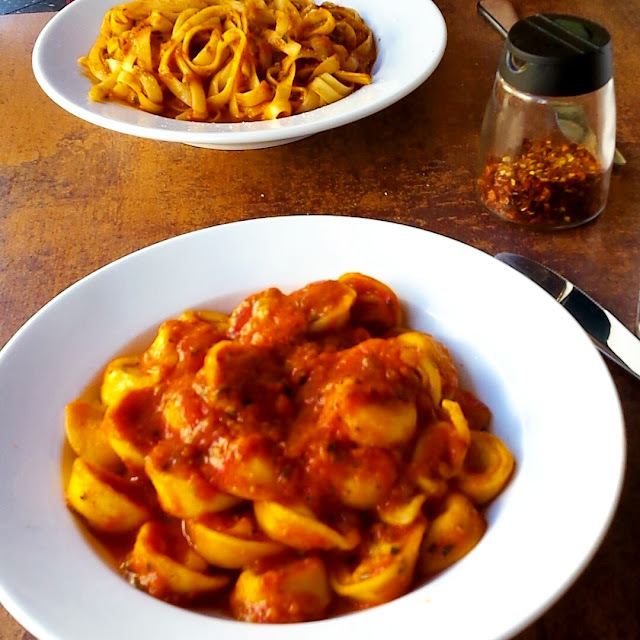 The tortellini was cooked perfectly and worked perfectly with the sauce. As we scrapped up the remnants of sauce on our plates we began to ponder what we should have for dessert (and don’t think it’s because the pasta wasn’t filling, it was but we knew dessert would happen regardless of how full we were). We decided we would go find the tella balls ice cream we had seen on Instagram earlier that week, so after working up an appetite browsing Newtown Markets we jumped in the car and drove to Dulwich Hill. We were surprised it was such a short drive and found a park near the café. Despite how busy it was, we were lucky enough to get a table outside straight away. We had come for the ice cream cone made out of a donut but the expansive menu did tempt us to sway from our decision but we ended up going with our initial choice. 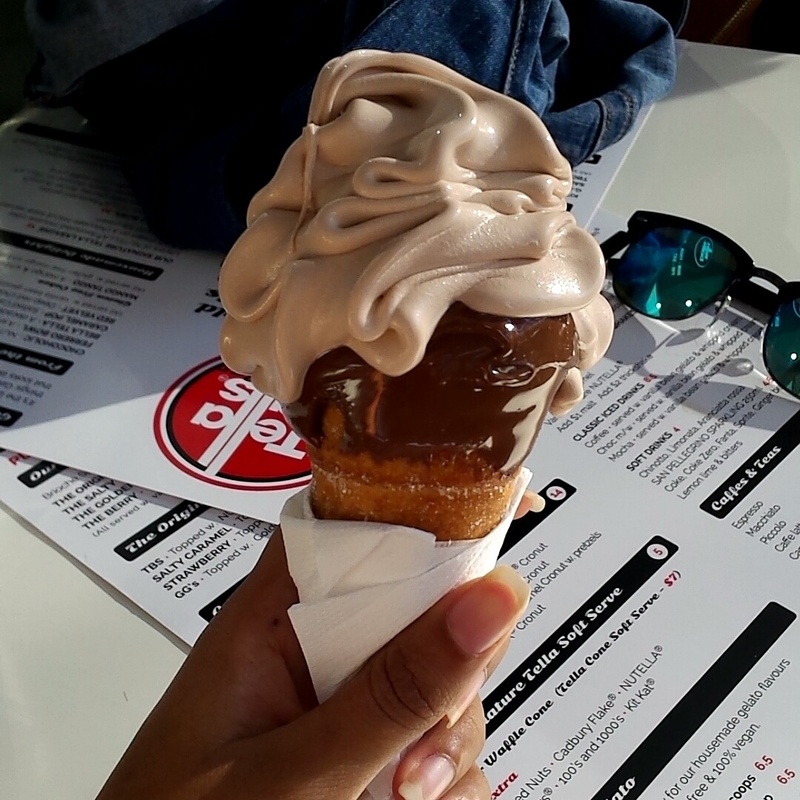 The $7 cone is a donut in a cone shape and filled with hazelnut soft serve ice cream and the mouth of the cone is dipped in Nutella. Totally decadent and totally delicious.